You are as beautiful as ever and full of wisdom. You take care of all our special needs, and you do it with an incredible display of selflessness and cheer. Thank you so much for everything you do. We love you lots and thank God for your every day -- Nathan, Annabelle, (Linnea), and Emily. 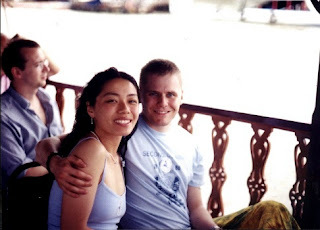 The picture is from our trip to Thailand in '01. Happy Birthday Diana! I know we haven't talked in a long while, but when you have some free time, give me a call. It's really good to see that you are all doing well :-)!! Tell Anabelle and Emily that Aliyah and Alyssa said hi. Happy birthday, Diana! I hope you guys are having a great time in Boston! It looks like a fun trip from the pictures. See you soon! Happy Birthday Diana!!! I hope you have a great day! I hope that you have a wonderful birthday and know how much light you bring into the world. Your ever-present faith and kindness is such an inspiration. God's blessings to you in your 28th year!